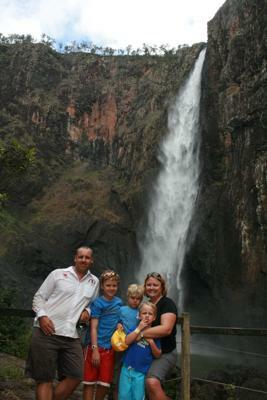 We visited Wallaman Falls as part of our around-Australia trip in 2010. Definitely worth the visit, and it was also a nice place for an overnight camp. My video shows the road in as well as giving you a good idea of what the walk down to the bottom is like. We didn’t have any trouble with poisonous plants! The area toward the end of the video is just a little way upstream of the falls, near the campsite. We had thought of going for a swim after the long and hot walk back up from the base of the falls, but the water was far too cold so we just watched the turtles instead.